Opposition leaders after signing a Memorandum of Understanding to work together in preparation of the 2021 elections in Kampala (file photo). All signs show Uganda will not take the road less travelled on the question of electoral reforms ahead of the 2021 general elections. It will be the usual business. A person who followed the poll reforms debate ahead of the 2016 general polls can be excused to think that a similar script is being followed ahead of 2021. The issue of poll reforms, also, casts doubt on whether there will, in fact, be general elections in 2021 but this is quickly dismissed by many observers who argue that regular elections serve President Museveni in many ways and is unlikely to break the cycle. The strategists of President Museveni and his ruling National Resistance Movement (NRM) party, for example, reportedly have a much grander plan for the entire process and have been working on their plan. One that started at least after the 2016 general elections, some say much earlier, and which is poised to serve the leader and the party well in the next election cycle. Why change a winning formula? So far, both President Museveni and NRM have played their cards very well keeping the local players and development partners in a game of chance and with each dice delivering returns to their cause. Since 2001, the Supreme Court and other institutions such as political parties, international observers have voiced concerns about the quality of the elections held in the country and have made proposals which government appears unprepared to look into or has chosen to ignore. The Supreme Court recommendations, for example, contained a prohibition of donations during elections, the regulation of the use of technology during elections and regulating the role of public officials in the political campaigns. These and many other reform proposals have been touted as magic bullets that will fix Uganda's election problems. "Government is committed to establishing a Constitutional Review Commission" and "the process is underway" has been the promise turned song over the years. But as the chickens come to roost, once again, players in the ruling establishment are using a "time crisis" they have relied on overtime to their advantage. Sources say NRM is holding on for as long as it can to benefit from the said time crisis that, for example, served the party's interests very well ahead of the 2016 polls. Every minute counts and in a few months to the 2021 polls, the argument will be about insufficient time. On May 23, 2018, Maj Gen (Rtd) Kahinda Otafiire, the Justice and Constitutional Affairs minister recommended 14 people to sit on the Constitutional Review Commission to consider the various constitutional reform proposals that have been received by government over time. Gen Otafiire recommended the former Attorney General, Prof Edward Kiddu Makubuya, to chair the commission deputised by former Speaker of Parliament and long-serving retired diplomat Francis Butagira. The recommendation was followed by a reminder to President Museveni on August 7. Yet on January 29, Gen Otafiire was before the House asking for more time. "Within the next six months, government intends to make final preparations relating to the establishment and appointment of the Constitutional Review Commission and securing of the necessary funds for the activities of the Commission," said Otafiire. What has prevented government from undertaking the exercise despite several undertakings? Why has the Supreme Court deadline been largely ignored? The questions are many but with few answers. In defining the next course of action, options are expected to be put forward, from the Executive, including one that is expected to gain widespread support from political office holders given the more than 60 per cent attrition rate in the House. This is the option of extending the mandate of the current government by two years to provide a conducive and freer environment for wide consultations on poll reforms. The option will be to go to the polls in the current set up whose outcome is more less known. It is such moves that a section of the Opposition is attempting to stop in Parliament were their chances of success are close to naught. Shadow Attorney General Wilfred Niwagaba has drawn a motion which seeks to introduce reforms as a matter of amendment to the Constitution, using a private members' Bill. On January 30, Leader of the Opposition in Parliament Betty Aol Ocan told journalists that the Opposition will seek leave of Parliament to present the Bill. "We shall move a private members Bill entitled the Constitution (Amendment) Bill, 2019, since the government has failed to present the necessary Bills," she said. "As the Opposition, we cannot fold our hands and let the National Resistance Movement-appointed Electoral Commission prepare and serve our nation another sham election." The Bill is expected to seek the introduction of federal governments, reinstatement of presidential term limits, and a new method to appoint the Electoral Commission to ensure its independence. It also seeks to have majority and minority leaders of Parliament, "strengthening the military by withdrawing them from Parliament and any partisan institutions and having a limited Cabinet of not more than 21 ministers," Ms Aol said. None of the proposals the Opposition has put forward are new in terms of not having been suggested before. The Achilles heel of the move remains the means to push the proposals through and have them enacted. Another move on the NRM and President Museveni's cards was hinted on by Mukono Municipality MP Betty Nambooze. Ms Nambooze has alleged that NRM has plans to introduce another way of electing the President--the electoral college. "We have learnt of a plot where the ruling party members will consider a constitutional amendment where the President will be elected by an electoral college, where the party with the majority MPs will automatically assume presidency. The Opposition is against the idea of life presidency," she said. MP Nambooze's allegations are not without foundation and those in the know say this plan is in the works and may or may never come to life depending on the prevailing political environment. President Museveni's New Year's speech on December 31, 2018, offers some insight. "In the constitutional review, Ugandans should address the issue of a discordant Executive and Parliament. In the UK, if the prime minister and the parliament do not agree, both of them resign and new elections are held so as not to cause paralysis in the development plans of the ruling political parties. It ensures continuous accountability through representation," he said. Parliament has given government up to the end of April to table electoral reforms. If, in the unlikely event, government honours that directive, it may take Parliament months to develop consensus and pass the said reforms, if any. Assuming government tables the reforms and these are debated with proposals from other groups and passed in whatever form, this is likely to have an impact on the Electoral Commission road map which was announced in December. The EC roadmap presupposes that any reforms will have been enacted by February to give the electoral body sufficient time to prepare before the election. It is already February and it is unlikely that government will do what it has failed to do in the last so many years. Again, assuming the reforms are passed shortly after April, the EC as constituted currently, that is if it is not part of the reforms, will have either have to work round the clock to organise the elections per the new rules or will have to postpone the exercise. Meaningful electoral and constitutional reforms are important ahead of any election in the country, especially in assuring citizens participation in the exercise with the full knowledge that their votes will be counted through a transparent and meaningful process. The laxity to institute reforms observers have opined is a means to frustrate and weaken Opposition against President Museveni and the ruling NRM in power for the last 33 years. Who wants to legislate themselves out of power when the trend can continue? Every election under President Museveni has had its stakes and 2021, if it is held, will not be any different. More and more young people who were unable to vote in 2016 because they had not come of age or were not registered because of the controversies surrounding the National ID registration exercise will now have no excuse after five years. This issue is reportedly so critical to those in power that plans are underway to depart from the 2016 register. The EC, in its roadmap, wants Shs115.8b to "acquire appropriate voter registration equipment" to help the electoral body in "registering voters instead of extracting data from National Identification and Registration Authority [NIRA] database". For the latest adventure, taxpayers will have to pay Shs115.8b. Either the current EC believes the 2016 registration process was flawed, and wants to clean up and come up with a credible process or may be assisting the powers that be to manage who gets to vote. Are the Opposition and other pro-reform campaigners such as in civil society organisations innocent in all this? Some observers put the blame on the Opposition and Civil Society groups for relenting in the push for reforms and reducing the entire exercise to yet another project. In the lead up to the 2016 general elections actors within Opposition groups and parties and in civil society organisations had come together and even created working documents such as the Citizens Compact which clearly spelled out what needed to be done. The energy to push for the reforms, reportedly died as the taps of donor cash to support such activities dried down. 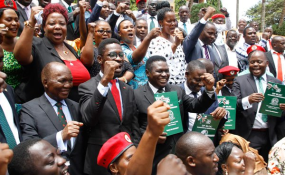 The passing of the Uganda Constitution (Amendment) Bill, 2015, without any serious reforms pushed by different groups including those agreed to with the ruling National Resistance Movement dealt a heavy blow to reform campaigners who quietly folded their efforts. By the time the 2016 polls were done, these groups had moved on to different missions. There is consensus that Uganda needs electoral reforms across the political divide. The question is, however, on which reforms to enact and when but most importantly in whose favour. Will it be Ugandans? With at least 90 per cent of the seats in Parliament, NRM is likely to have the last word.